Criticism of Donald Trump’s tariff action, particularly by archrival Sen. Elizabeth Warren, is too often cast as simply political maneuvering, but there is a very real issue underpinning this current argument. That is, to be successful tariffs need to block imports and support domestic production — otherwise, what’s the point? Unfortunately, the consequences of tariffs are not that simple. Some domestic mills will object to imports of certain products on the grounds that they manufacture the same product. But as my colleague Lisa Reisman pointed out so eloquently in a recent post last month, quality comparisons are analogous to the quality of your steak joint: they all serve meat, but what do you want a Peter Luger or Ponderosa? CNBC reports Warren’s criticism of the tariff waiver program, citing research done by her staff, that foreign-headquartered companies received more than 80% of all exemption requests (of 909 decisions posted by the Commerce Department in the first 30 days after the tariffs were announced). The majority of waivers — almost 52% — went to Japanese-owned companies, and overall 84% of their requests were approved, the article states. 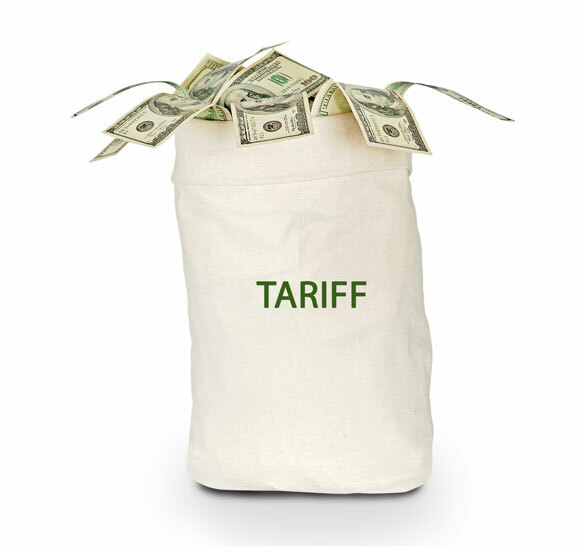 The implication being the waiver program is in crisis and exemptions are being granted in favor foreign firms, undermining the objectives of the tariff program. By way of background perspective, CNBC reported that as of of Oct. 29, 43,634 steel and 5,667 aluminum exclusion requests have been filed. Overall, 15,662 steel exclusion decisions have been posted (and 11,281 were approved), while 905 aluminum decisions have been posted (and 763 approved). Yet, as Reisman pointed out, not all grades are equal, even if they are nominally manufactured to the same standard. Taking her example, grain-oriented electrical steel (GOES) manufactured by a Japanese mill is superior, you cannot fault consumers for applying for tariff exemptions if the domestic product is below global standards. Of course, GOES and Japanese material in particular, is arguably a unique example (it is hardly vanilla HRC). From a quality perspective, it is easy to understand why Japan has more exemptions than other countries: they simply make grades and materials that are not produced elsewhere in the world. So, the number of exemptions by country doesn’t tell a complete story. By comparison, Turkey is having a tougher time because their products are, to put it bluntly, lower on the food chain and there are undoubtedly many top-quality producers in the U.S. of comparable material. What does require further investigation, though, is why firms based in the U.S. but with foreign headquarters — essentially, subsidiaries of overseas firms — should be more successful than domestic consumers in achieving waivers. 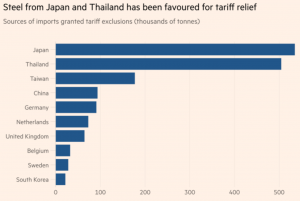 As this graph from the Financial Times shows, Japan and Thailand have been by far the most successful in achieving waivers. While material from Japan and Thailand has been the most successful, imports from Turkey, Canada and Brazil have been among the least successful. There have been 135 requests decided for tariff exclusions for imports from Turkey, 32 from Canada and 23 from Brazil. The administration has granted just one request for Turkey, none for Canada and none for Brazil, the Financial Times reports. These figures in themselves, though, do not explain why foreign-owned subsidiaries have had greater success in achieving waivers than U.S.-owned businesses. The Commerce Department accuses Warren of misunderstanding the process — it wouldn’t be the first time a politician misunderstood a piece of legislation — but you would hope she was receiving expert advice, so let’s assume she has it right. If that is the case, the Commerce Department has a case to answer, and an audit is apparently underway. If these tariffs are to achieve the desired effect and if they are to be worth the cost to American firms and consumers (Ford Motor said it expects the steel and aluminum tariffs to cut $1 billion from its profits by the end of next year), then waiver decisions cannot be made in an arbitrary manner. These decision should work to an overall strategy that furthers the president’s aims, rather than hinders them.